Di-Corp offers two versions of Rod Shoes to be used with drill rod if used to case a hole. Level 1 (T11) is a general purpose Rod Shoe suited for most drilling conditions through overburden. Level 2 (T12) is a premium shoe for more difficult overburden drilling conditions for improved life with increased diamond concentration, extended impregnation depth and gauge setting. 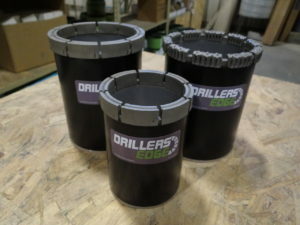 If drill rods are used to case the hole, Rod Shoes are to be used to assist in seating the drill rods into the bedrock. Note:The inside diameter of the Rod Shoe is not set with diamonds and is flush with the inside diameter of the drill rod to allow the core barrel to pass freely. Available in sizes: NWL (T11 & T12), HWL (T11 & T12), and PD (T11 & T12).